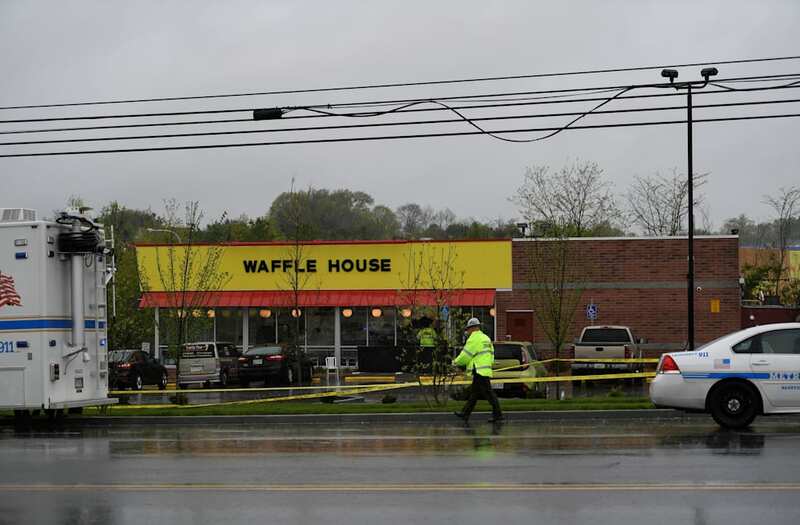 Tennessee authorities identified the four victims – including a restaurant employee, a musician and a college student – who were killed when a naked gunman opened fire at a suburban Waffle House early Sunday. Suspect Travis Reinking, 29, pulled up to the eatery in his pickup truck and waited several minutes before fatally shooting Taurean Sanderlin, a Waffle House employee, and 20-year-old Joe Perez with his AR-15 rifle outside the restaurant, authorities said. Inside, he gunned down 21-year-old DeEbony Groves and 23-year-old Akilah Dasilva, who later died at Vanderbilt University Medical Center. Hero James Shaw Jr., 29, managed to throw Reinking's weapon over the counter before the shooter fled the scene, police said. Shaw said he heard Sanderlin say he was going to take a break before he went outside, according to the Tennessean. Sanderlin worked for the Waffle House franchise for about five years, Waffle House CEO Walt Ehmer said. Dasilva, of Antioch, was a local musician who went by the nickname of "Natrix." "He was talented, loved music," a friend of Dasilva's told News Channel 5. "I can't believe it." She said she and Dasilva have performed together and he helped his community by making music videos. Groves, of Gallatin, was a senior studying social work at Belmont University. She was remembered for being a bright student and a great basketball player. "She was a brilliant young lady, very intelligent and a very hard worker," said Gallatin High School coach Kim Kendrick, according to the Tennessean. "She was a very likable young lady. She was one of three seniors on her team, and she was a great role model for the other players because of her hard work and dedication to her studies and to her school." Belmont University released a statement saying it was "shocked and devastated by how such senseless violence has taken the life of this young woman, an individual full of immense potential." Groves was also a member of the Tau Nu Delta Sigma Theta sorority. Her fellow sorority sister from another university, 24-year-old Sharita Henderson, was wounded and taken to Vanderbilt University Medical Center during the shooting. Authorities are still searching for Reinking who they believe is carrying two firearms.